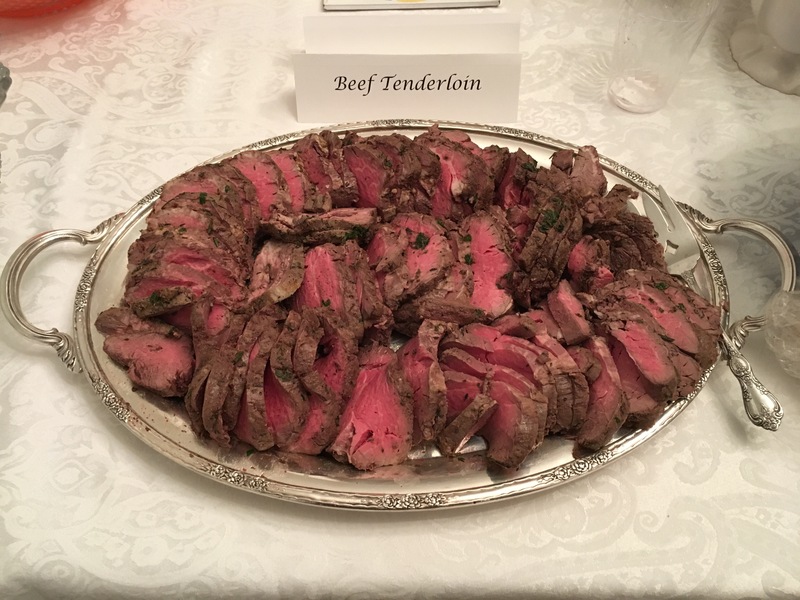 This beef tenderloin recipe is a lovely special occasion dish. When I purchase the meat I look for a good quality beef cut labeled PSMO (Peeled, Silver Skin, Side Muscle On), when I can find it because, although it involves some trimming (plenty of YouTube videos show how), it is more economical. As in several other meat recipes on my blog I like to roll the beef in an olive oil herb bath as soon as it comes out of the oven and let those herbal flavors infuse into the meat. I roast the meat the day before I intend to serve it, wrapping it in plastic wrap and foil to chill. The next day, slice it while cold, then let it come to room temperature. Begin by mixing together the olive oil and herb bath. Set it aside. Take tenderloin out of the refrigerator and let it come to room temperature for one hour. Remove the silver lining strip on the meat. Tuck the small ends under the meat. Tie it with bakers string to keep it together. Preheat oven to 425 degrees. Place the roast on a half sheet baking pan. Drizzle meat with olive oil and rub it all over the roast. Season with salt, pepper, onion powder, and garlic powder. Roast for 30-38 minutes until the thickest part of the roast is 125 degrees. Remove from oven and immediately roll the meat in the olive oil herb bath. Let sit in the oil for about 30 minutes, turning occasionally. Remove the meat from the herb bath liquid. Save the herb bath and refrigerate it to drizzle over the meat before serving. Wrap the beef in plastic wrap, then in foil. Chill meat overnight. The next day, slice beef tenderloin while cold into 1/2-inch slices. Place on a serving platter and let come to room temperature. Drizzle the reserved olive oil herb bath over the meat and serve. Serves 10-15. This entry was posted in Beef, Christmas, Easter, Thanksgiving. Bookmark the permalink. This must be what you served at the Christmas party at your house. It was the most tender and lovely of tastes. Thank you! Yes, it is what I served at the party. Several people wanted the recipe and I’m finally getting around to posting it. Thank you for commenting and supporting this little blog.